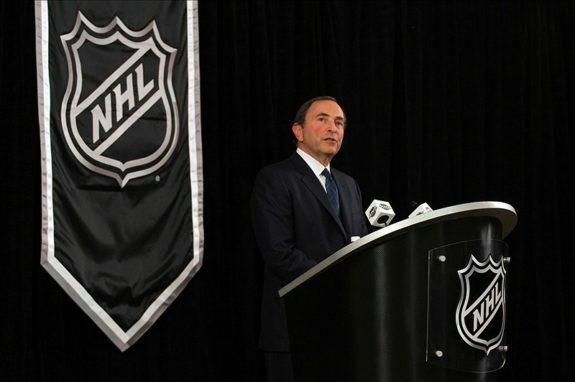 Will the NHL's Latest Proposal End the Lockout? NHL Proposes 50-50 Split Of HRR: Will The Lockout End? Gary Bettman and the owners “blinked” first, but will the NHLPA sign off on a 50-50 split of HHR? With news hitting the airways that he NHL has forwarded a new CBA proposal for the NHLPA to review there is once again hope that NHL hockey might just be around the corner. In an effort to save the 2012-13 season and avoid a public relations nightmare the NHL has offered up a six-year deal that would see hockey related revenue split 50-50 amongst the owners and players with the season starting on November 2nd. On the surface a 50-50 split looks fair for both sides, but the players are said to be weary of such a deal as the verbiage surrounding HRR still seems a bit cloudy, which means the two sides will have to come to an agreement on this before anything is signed. Under the terms of the old CBA HRR was split 57-43 in favor of the players, so a 50-50 split would be a significant concession on the NHLPA’s part. Judging by outcomes of recent CBA negotiations in other sports, a 50-50 split is all but inevitable. The NFL has a 50-50 split. The NBA has a 50-50 split. So why not the NHL? The real question has always been how the two sides get there, although the players have said all along that they wanted a “fair and equitable deal” and a 50-50 split when you are currently holding a decided advantage over the owners at 57-43 might seem like a stretch to some. A six-year deal means that 50-50 split would have to be in place by 2019-20, but the NHL may push for the split to take place at an earlier date. In the end both sides want to play hockey, and the fans are chomping at the bit to see the puck drop in their respective rinks. If the season was to start on November 2nd, NHL Commissioner Gary Bettman has said that the league would have to add one game every five weeks to the schedule in order to make up for lost time. Of course, with the two sides concentrating on how to split the revenue pot nobody is talking about how all this might hurt the fans. How long before greedy owners looking to bank even more revenue and make up for what may be inadequate revenue sharing lead to the raising of ticket prices at a rink near you— is this the reward we fans have to look forward to? The NHL’s latest proposal, while a good start, is hardly a done deal. The one saving grace is that the NHL looks to have “blinked” first, which was thought to be an impossibility as little as a week ago. Now the attention shifts to the players and how they will react to the latest CBA proposal. It is fairly obvious that the players will not agree to everything written in the NHL’s latest proposal. The Players now have ten days with which to either sign the deal or make a counter offer, which would seem to be the more likely thing to happen. From the outside looking in the owners look to have the players by the tail. Sign and the players will lose a little money. Refuse to sign and the players stand to lose far more. Clearly, both sides want to get a deal done, as do the fans. It will be interesting to watch the NHLPA’s response and the objections that come with it. In the game that is CBA poker, the hands have been dealt, the flop has been revealed, now it’s just a matter of a few cards before the two sides have to fold or go “all-in”…may the best hand win!